Moscow and the Russian Golden Ring. This tour includes 4 days of Moscow tours and 5 days travel in the Golden Ring of Russia. . This Russian Golden Ring tour turns the pages through almost a thousand years of Russian history. You will cover about a thousand kilometers in seven days and visit some of the most important centers of Russian history. We will visit ancient forts and monasteries that reveal a continuity of Russian tradition that has survived a long history of occupations and invasions. Arrival in Moscow transfer to the hotel for check in and city orientation tour. Further activities for the first day will take into account the journey you have just made. We begin your first full day with a private tour of the Kremlin. The Kremlin was first built to contain the whole Moscow settlement over 800 years ago. In the afternoon we will visit Kolomenskoe park. Established as a country residence for Ivan the Terrible and located on the Moscow river it controlled one of the Main points of entry to the city of Moscow. On the second day we begin our tour of the Golden ring by road to Vladimir. On the way we will pass through villages that seem to reflect a style of life reminiscent of a hundred years ago. Vladimir predates Moscow as a center of Russian power. The afternoon will include a general tour of Vladimir and Suzdal, accommodation at Tour Center, and dinner. Following breakfast the next day we set out for Gorokhovets, a small old Russian town famous for its monasteries, honey, and radish. Includes a general tour of the town to see the Gorokhovets Posad Stone Chambers, the architecture of Nikolsky Monastery, the Church of the Annunciation, and the Sapozhnikov Museum House. Bus to the Village of Mstera to visit the art shops of the world-famous Lacquered Miniature Factory Hou HouHou, return to Suzdal for the night, and dinner. The next day we set out to spend the night in Kostroma. Blues skies over silver waters, a small boat with sails fluttering in the wind denotes the emblem of Kostroma. In olden times Kostroma was known as "the flax capital of the north": it supplied Western Europe with the world's finest sail-cloth. Situated at the meeting of two rivers, the Kostroma and the Volga, Kostroma is a jewel. The oldest building in the town is the cathedral of the Monastery of Epiphany and was built in 1565. The pride of Kostroma is the museum at the former Ipatyevsky Monastery which played a part in almost every important event of the town's history. The monastery itself was founded in the fourteenth century. by the Zernov family of feudal lords, who were the forbearers of the Gudonovs. 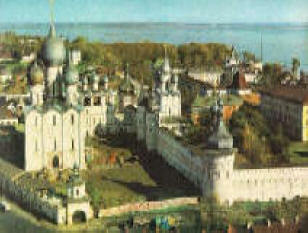 The stone walls and the fortress were erected during the reign of Ivan the Terrible. Today Kostroma is the only city in Russia which has retained the layout formed in its central part during the eighteenth century. Not far from Ipatyevsky Monastery is a reconstructed wooden village depicting the life of old rural Russia. Russians built (and still build) log cabin style buildings which are notable for the complete absence of nails. After breakfast we travel to Yaroslavl, Rostov Veliky and Pereslavl Zalessky three of the most important towns of the Golden Ring. 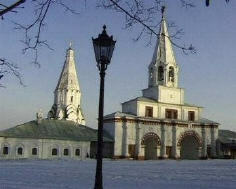 Yaroslavl is located high on the bank of the Volga river. At the confluence of this broad majestic river and the small Kotorosl river was born the long history of Yaroslavl. About a thousand years ago in 1010 Rostov Prince Yaroslav (later Yaroslav the Wise) founded a fortress here in order to strengthen his territory around the greatest center of the north-east Rus - Rostov Veliky and to secure safety of the water ways. He named his fortress after himself. In the 10th century before the foundation of the fortress a settlement of pagans was located in this place called Medvezhy Ugol (Bears Corner). According to the legend Prince Yaroslav killed their sacred animal a Bear and subjugated the pagans. The legend about this event found is represented in the symbol of the city "On a silver shield a Bear is represented standing and holding a gold pole-axe in the left paw". After exploring Yaroslavl we move on to Rostov Veliky where we visit the Kremlin and the Rostov Enamel Museum. The first reference to Rostov is made in the ancient Russian chronicle "The notes of the Past Years". The reference is connected with the year 862. However the area near the lake Nero was populated in the prehistoric times. Rostov became one of the largest towns in the North-east Ancient Russian state in the 10th century. Leaving Rostov we move on to spend the evening and night in Pereslavl Zalessky. Peter the Great chose Pereslavl Zalessky to build the first Russian fleet. Alexander Nevskii the saviour of Novgorod was born here. Here is still standing a 12thC cathedral one of only nine pre-tartar cathedrals still standing in central Russia. Still standing are many monasteries from the 16thC, 17th and 18thC. The first half of the day we shall tour the this classic town of Pereslavl Zalessky that preserves many elements of its long history. In the afternoon we begin our return to Moscow. Our morning will be spent at the famous Tretyakov art gallery. The Tretyakov contains an incredible collection of Russian art from the earliest times to the present. In the afternoon we shall lunch in true Russian style in one of Moscow's fine restaurants. Farewell breakfast and transfer to airport. Accommodation is 4 Star (Usually Ukraina ). Concert or circus tickets are not included as they are subject to seasonable availability. If you have a special interest please let us know so that we can make advance arrangements. Your host for your tour will be flexible with the schedule to get the most out of weather fluctuations and special interests. Museum tickets are included.